The last twenty years have witnessed profound changes in art history, the greatest of which stem from the social and cultural perspectives now attached to art scholarship. Written by scholars at the forefront of new thinking, many of whom are rising stars in their fields, the Oxford History of Art series offers substantial and innovative texts that clarify, illuminate, and debate the critical issues at the heart of art history today. Providing a fresh new look at art that moves away from traditional elitist approaches, the series makes use of new research and methodologies, as well as newly accessible and non-canonical works to offer comprehensive coverage of the art world from archaic and classical Greek art to twentieth-century design and photography, from the artistry of African-American and Native North Americans to the masterpieces of Europe, Polynesia, and Micronesia. Lavishly illustrated and superbly designed, the Oxford History of Art brings new substance and verve to the exciting and ubiquitous world of art. China boasts a history of art spanning 5,000 years and embracing a wide diversity of images and objects--from jade tablets, painted silk handscrolls and fans to ink and lacquer painting, porcelain-ware, sculpture, and calligraphy. But this rich tradition has not, until now, been fully appreciated in the West where scholars have focused their attention on sculpture, while largely ignoring those art forms most highly prized by the Chinese themselves, such as calligraphy. 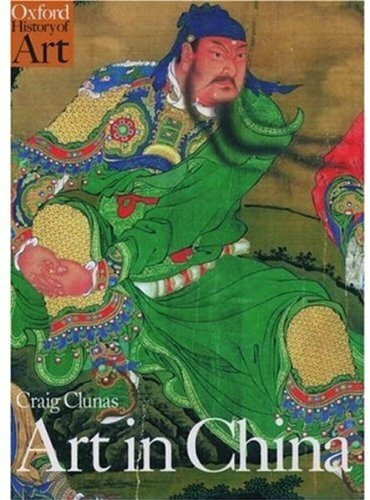 Now, in Art in China, Craig Clunas marks a breakthrough in the study of the subject. Taking into account all the arts practiced in China, and drawing on recent innovative scholarship, this rich text examines the production and consumption of art in its appropriate contexts. From art found in tombs to the state-controlled art of the Mao Zedong era, Art in China offers a novel look and comprehensive examination of all aspects of Chinese art.